Autumn is by far my favourite season. I love nothing more than cwtching up by the fire in the evening, with a nice glass of wine watching all the cheesy pre Christmas TV. I have also been relishing the opportunity to whip out those dark, vampy lip colours that can only be acceptably worn during the day if it's Autumn/ a colder season. I find this to be a hybrid between a liquid lipstick and a lip-gloss. 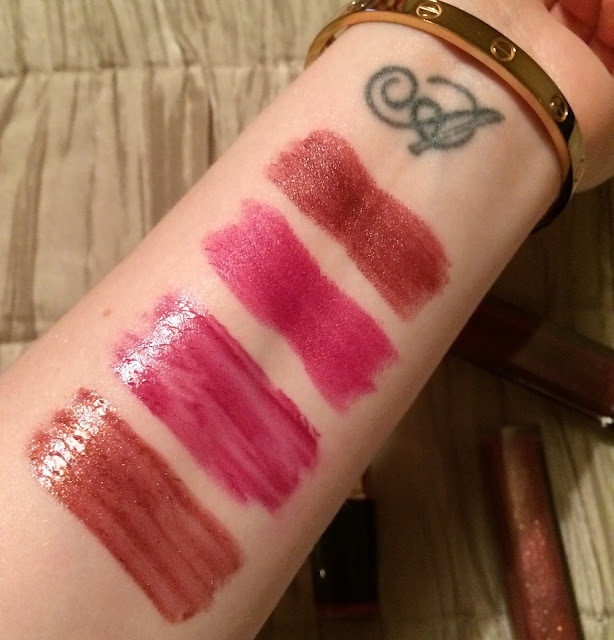 It has a mousse like texture and it feels incredibly light on the lips. I'd describe this as a warm burgundy shade with a gorgeous gold shimmer running through it. I like to keep this in my desk drawer as a transition colour from day to night. This one is by far my favourite lip gloss ever, regardless of the season. I feel like a million dollars when I wear this. It's highly pigmented, but can be a little tricky to apply. I start by using the doe foot applicator that it comes with, then finish with a lip brush to create a crisp edge. I don't usually use a lip pencil with this, but MAC's Vino would look fab underneath. This gorgeous lipstick was gifted to me by my fabulous friend India, ie The Jewel Beauty. She picked this up in duty free but accidentally got the wrong shade. She knew this would be right up my street though so kindly passed it over. This is more brown toned than I would normally pick up myself but it somehow translates to a lush burgundy shade when worn on the lips. I absolutely love it! I imagine this to a darker, more sultry version of the 'Kylie Jenner lip'. This is my latest lipstick acquisition and the cheapest of the bunch. Make up Revolution have recently launched their Iconic Pro Lipsticks and this is my favorite shade out of the ones I have. 'No Perfection Yet' is a Raspberry/ Plum-y shade that is really unusual, it's warm yet cool toned at the same time, if that makes any sense?! It has a really soft formula and again I find this applies best with a lip brush for precision. I also really love the rose gold and black packaging!